Equipped with modern high speed, high volume molding and casting machinery, the Romac ductile iron foundry specializes in producing the highest quality castings in the most efficient manner. Modern Casting magazine called the Romac Foundry one of 'America's Best Induction Meltshops'. Romac purchased the foundry in 1975 to produce castings for our line of pipe products. In 1995, we expanded on the five acre site, and modernized the entire facility. 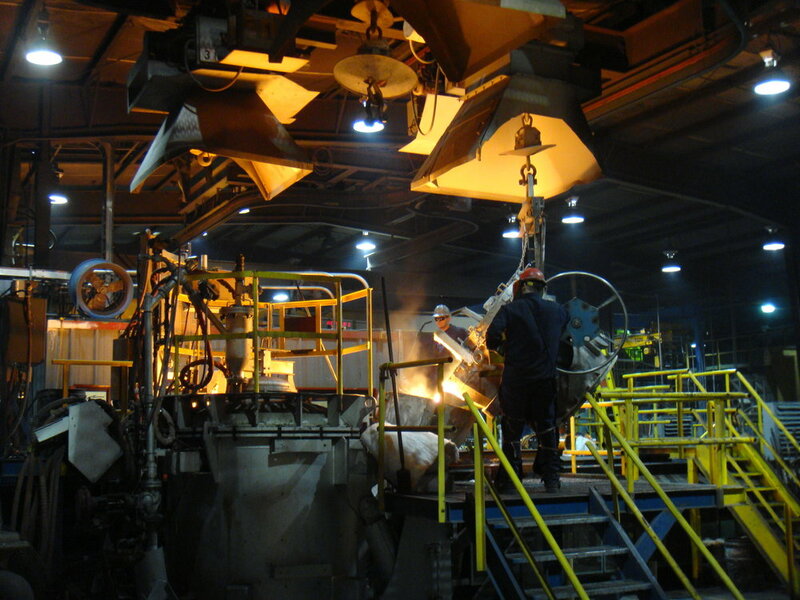 The modernization enabled the Romac foundry to produce castings fast and efficiently. With the new high speed, high capacity equipment, we entered the general foundry business. Since then we've produced a broad range of castings for numerous industries. We currently pour two grades of ductile iron. 65-45-12 (our most common grade). 80-55-06 (frequently poured, lower volume). Two 6-ton capacity ABB electric melt furnaces with a shared four megawatt power supply. 8 to 10 tons per hour capacity. Two Disamatic machines. Mold Cake Size: 25" wide x 20" high x 5" to 14" deep. Maximum Part Dimensions: 21" x 16" x 10" with some exceptions depending on part shape. Maximum Part Weight: Approx. 90 lbs. Average Molds Per Hour: 400 non cored, 260 cored. Via one of two five ton Autopour with laser/computer controlled stopper rod pouring system. Dual laser system creates consistent control for efficient quality and productivity. One laser identifies the opening in the mold and begins the pour. The second laser identifies when the mold is full and stops the pouring. Romac's foundry reguarly produces specialized castings with thin cross-sections. Spectrometer integrates with database to record metal chemistry. Hardness tester to monitor hardness . Microscope with video displays and picture recording capability to view and document crystalline structure. In house computerized tensile test machine with dedicated CNC machine center to make pull test bars. Written procedures, ISO 9000 aligned. Two 100B mullor machines with digital sampling and control system. A full sand lab with equipment to measure and track sand grain fineness, compatibility, compressibility, clay content, dead clay, moisture content, shear strength, and percent organics (sea coal). Our experienced pattern shop technicians are skilled in the art of pattern making, gating and risering. Casting patterns can be quickly created from drawings, or solid models. We continuously test and improve castings with computerized solidification modeling. Pattern storage facility is temperature controled to ensure consistent quality. High volume castings are ground or trimmed under robotic control by one of our specialized robots. We have a talented staff of finishing technicians trained to finish castings according to specifications listed in our casting matrix manual. All castings that leave our foundry receive the same attention to detail that our own Romac products get. Raw materials are scrutinized to ensure conformance to specifications. Quality technicians sample castings for conformance to requirements and work with our Romac Engineering department to improve our written procedures and training in conformance with our ISO-9000 aligned standards. Other operations may be available upon request.